Railpictures.ca - Dave Burroughs Photo: NYC 7440 is at the work site cleaning up a derailment on the CASO Sub. near Townline Road. A new track panel is being moved into position to replace the south track which got ripped up when about 15 cars derailed. | Railpictures.ca – Canadian Railway Photography – photographie ferroviaire Canadienne. 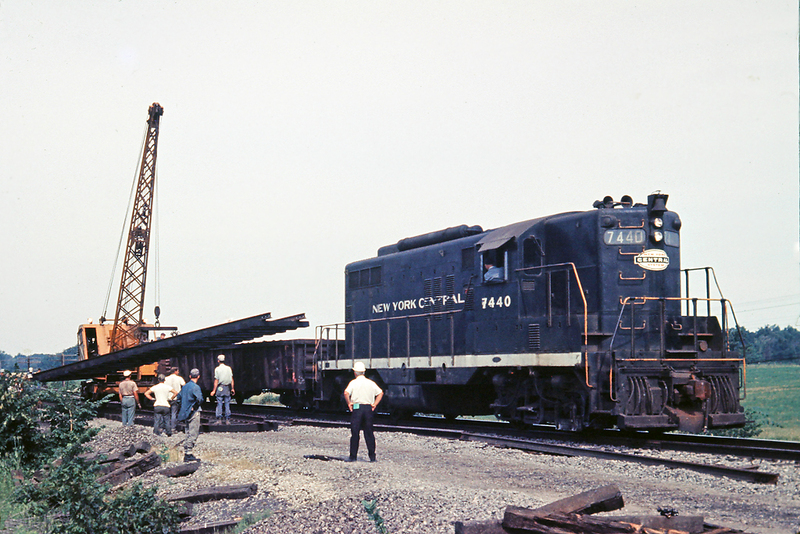 Caption: NYC 7440 is at the work site cleaning up a derailment on the CASO Sub. near Townline Road. A new track panel is being moved into position to replace the south track which got ripped up when about 15 cars derailed. Jakob, as most model railroaders would know, Atlas had snap track long before this. In all seriousness, it was a fast way to rebuild. Just roll up a gondola full of track panels and drop them in place. Not many guys wearing hard hats or orange vests back then. I did not know that track panels were used that long ago.